A soft icing with a hard surface made by boiling icing sugar and water with cream of tartar. Often flavoured with chocolate or coffee. Made by mixing icing sugar with water to form a smooth, shiny spreadable icing. Used to cover cakes or for piping decorative patterns as it will hold its shape when dried. A stiff icing made with egg whites and sugar that can be used to give a smooth flat surface or a peaky surface. Dries very hard and traditionally used for wedding cakes. Made from a cooked paste of icing sugar, water and glycerine to produce a soft, smooth icing that is pliable and easy to mould. It can be used for modelling decorative shapes. All you do is mix one vanilla pudding packet with half of the milk called for on the package. Whisk until it begins to thicken. Then fold in one container of Orley whip. A great frosting spread on cakes and piped onto cupcakes, a tasty filling in crepes or on waffles along with some fruit...way less sugar too!!!! Beat butter and 3 cups sugar with a mixer on medium speed until combined. Reduce speed to medium-low, and continue to beat, gradually adding remaining 6 cups sugar, 1 cup at a time. Raise speed to medium-high; add vanilla. Beat until pale and fluffy, about 3 minutes more. Beat cream cheese and butter with a mixer on medium speed until pale and fluffy, about 3 minutes. Sift together sugar, cocoa powder, and 1/4 teaspoon salt; gradually beat into cream cheese mixture. With machine running, pour in melted chocolate in a slow, steady stream. Beat in creme fraiche until well combined. If frosting doesn't seem firm enough, refrigerate for 10 minutes. 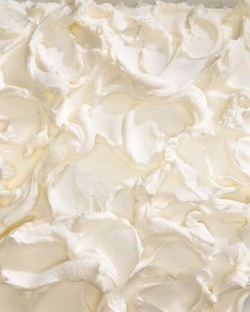 Cream cheese frosting is a delicious complement to cheesecakes, carrot cakes and red velvet cakes. Use full fat cream cheese in the following recipe, as the lower fat cream cheese may make your icing too runny due to its softer consistency. Beat the cream cheese until soft. Mix in the lemon rind and juice. Add the icing sugar, to taste. Ice your cupcakes and EAT THEM. Spread melted chocolate on a marble surface or use the back of a baking tray. Allow to just set so the chocolate is still a little soft. Using a knife at a 45° angle, scrape the chocolate to form curls. *Without the sugar, this mousse is VERY intensely chocolately. If you generally prefer a milder chocolate taste, add the sugar. Place a mixing bowl on top of another slightly larger bowl filled with ice and cold water. The bottom of the top bowl should touch the ice. Set aside. Put chocolate and water (and sugar if using) in a medium pan over medium heat. Once melted, pour the chocolate into the bowl sitting on top of the ice and begin whisking. Whisk constantly until mousse begins to thicken, 2-3 minutes. Be careful not to over whisk as the chocolate can become grainy. Divide into four ramekins cups and serve immediately OR you can let mousse set up in the fridge for 30 minutes to an hour if you prefer a slightly thicker, chilled mousse. You can store any left over mousse covered in the fridge for up to 3 days. When working with ganache, make sure it’s warm enough to pour. If it’s too stiff, fill a small saucepan with an inch of water and bring it to a simmer over low heat. Set the bowl of ganache over it and melt, stirring, to the desired consistency. Ganache refers to a variety of icing, fillings for pastries and glazes. It is typically made from chocolate and cream. The rich chocolate glaze is normally poured over cakes to create a glossy, beautiful finish. Pour the cream into a saucepan and bring to the boil. Remove the saucepan once boiled. Place the chopped chocolate into a mixing bowl. Mix until all the chocolate has melted. GlaZe icing is a simple versatile icing that can be used on almost any baked item. You can change the consistency and colour with the use of food colouring and water. Then fold in one container of Cool Whip. A tasty filling in crepes or on waffles along with some fruit...way less sugar too! Stir together the sugar, corn syrup, water, and salt in a small saucepan over high heat. Bring to a boil, stirring occasionally, until the mixture reaches 240°F on a candy/fat thermometer. Slowly drizzle in the rest of the syrup. Increase the speed to medium high and whip until the marshmallow crème is stiff and glossy, about 7 minutes. Add in the vanilla and whip 2 minutes more. Use immediately or refrigerate stored in an airtight container for up to 2 weeks. In a large bowl of an electric mixer, add egg whites, corn syrup, and salt. Using your electric mixer on high speed, mix for approximately 5 minutes or until the mixture is thick and volume has almost doubled. Your homemade marshmallow fluff/cream is now ready to use in your recipes. Use immediately, or refrigerate in a covered container for up to 2 weeks. Marshmallow fluff is a spreadable marshmallow cream that closely resembles a whipped and sweetened cloud. Food for angels. Marshmallow fluff is most famous for being half of the duo that makes up the beloved fluffernutters. Peanut butter and fluff sandwiches. You can also use it to make moon pies, broiler s’mores or to frost a cake since it’s almost identical to Italian meringue. A gooey dollop dropped into hot cocoa is heavenly bliss. Of course if none of this suits your fancy you can always eat it off a spoon. . . it’s pretty hard not to. Beat egg whites together until light and frothy using an electric stand mixer with the whisk attachment. With the mixer running, slowly pour in 2 tablespoons sugar; beat until soft peaks form. In a large saucepan, combine 1/3 cup water, corn syrup, and remaining 2/3 cup sugar. Place over medium heat and cook until boiling. Drape an old, clean kitchen towel over the front and side of the mixer, leaving one side open to pour in the syrup. With the mixer on low, slowly add hot syrup to egg-white mixture ( make sure kids and pets are not nearby, this could scar you for life, people(!) and scares the living daylights out of me!). Increase mixer speed to high and continue beating for 6-8 minutes. Add vanilla and continue to beat until mixture looks like marshmallow cream, 2-4 minutes more. Allow to cool, spoon and store in tightly sealed jars in the refrigerator up to a month. Prep time: 15minutes plus chilling. Fold marshmallows into whipped topping; set aside. Bring 2 cups water to boil. Dissolve lime and lemon gelatin separately in 1 cup water for each. Add 1/2 cup cold water to each. Stir orange segments into lemon gelatin. Pour into separate 8 inch square baking pans, chill until firm. Cut into 1/2 inch cubes. For each serving, layer parfait glass with lemon gelatin cubes, 1/4 cup marshmallow mixture and lime gelatin cubes. Top each parfait with remaining marshmallow mixture. 6 servings.Prep time: 15minutes plus chilling. Spoon dessert topping over prepared pudding, fresh fruit or pound cake. Marshmallow fondant is easy to make and pretty fun to use. You can cover cakes and cookies with it to give them a smooth professional-looking finish or you can cut out shapes and designs to decorate your icing with. Its cheaper to make your own fondant than it is to buy it pre-made plus the pre-made stuff tastes a bit like cardboard unless you are willing to pay for a very high end product. I use gel colours to dye my fondant but regular food colouring will work too. fondant sticky, but for lighter colours you can just even it out with more icing sugar. I also had lemon oil and coconut flavoring on hand..
Take a couple of handfuls of marshmallows and put them in a microwave safe bowl. Add a couple of drops of water and toss the marshmallows in it until they are all a bit damp. If you are going to just make one colour then put the whole bag of marshmallows in the bowl and add a couple of teaspoons of water. Stick the marshmallows in the microwave for ten seconds at a time until the are puffed up and easily stir into a goo with a wooden spoon. Grease your spoon with butter, things can get a bit sticky. Add food colouring to the melted marshmallows until you get the colour you want. Remember that you're going to be adding icing sugar which will lighten the colour so make it a bit brighter than you need. Start folding icing sugar into the marshmallow goo until it becomes a soft and fluffy dough. Sprinkled with icing sugar. Continue to knead in icing sugar until the fondant is stiff enough to roll out. smaller batches of darker colours. The dark purple and dark green weremade from the a light pink and light green. To store your fondant wrap them in pieces of lightly greased plastic wrap and keep them either in a big ziplock bag or a tupperware container. The fondant is essentially a sugar paste (its just marshmallows and icing sugar) so it has a shelf life of three or four months. If it feels a bit stiff and hard to use after being stored for a long time you can soften it up by kneading a bit of butter in or putting in the microwave one-two seconds at a time. Combine the frozen pineapple with the almond milk and honey blend until frozen sorbet texture is achieved . For an authentic dole whip presentation, transfer the frozen dessert to a large plastic bag ( zip-lock works) cut off the tip to create a piping bag, pipe the pineapple whip into 4-6 glasses and serve immediately. Any leftovers can be frozen in an ice cube tray and used in smoothies later. Royal Icing is a pure white icing that dries to a smooth, hard, matte finish. Besides its lovely finish it also colours beautifully which makes it a favourite of professionals who use it not only for frosting cakes and cookies, but also for intricate piping of decorations (flowers, borders and lettering). Beat the egg whites until they have been broken down. Add the icing sugar gradually until the mixture starts to thicken. Beat the mixture with an electric beater set at the slowest speed for about 10 min – until the icing is light and fluffy. You can adjust the consistency accordingly by either adding more icing to thicken, or drops of water to thin the mixture. Combine the sugar, water, and the corn syrup in a large saucepan and stir with a wooden spoon over medium heat until sugar is dissolved. Continue to cook until the caramel turns an even amber color then remove from the heat and let stand for about 30 seconds. *** Be careful here *** Pour the heavy cream into the mixture. The mixture will bubble up significantly and is very hot. Cream together cheese and margarine, add vanilla and strawberries. Add confectionery sugar until frosting reaches desired consistency. Pour over cake. Garnish cake with addition strawberries. This icing is similar to the basic butter cream recipe, except that some cooking is required in order to dissolve the sugar and egg white. This process makes the Swiss Meringue icing more smoother and fluffier than your normal buttercream. Mix together the egg whites, sugar and salt in a bowl. Place the bowl over a pan of simmering water and double boil the mixture for 6-12 minutes until the mixture is warmed through and the sugar has dissolved. Whisk until the mixture has cooled and the consistency is fluffy. Beat with a mixer at medium speed until foamy. To a medium saucepan, add water to a depth of 1 inch, and bring to a low boil. Set bowl of egg mixture over simmering water, making sure bottom of bowl does not touch water. Beat egg mixture at high speed with a mixer for 7 to 12 minutes or until it forms stiff, glossy peaks. Remove bowl from heat, and beat for 6 to 10 minutes or until cooled and thickened. It WONT melt at room temperature like regular whipped cream! Combine the cream cheese, sugar, vanilla extract and almond extract in a large mixing bowl or the bowl of your mixer. Once all in the bowl, mix on medium speed until smooth. Stop and scrape the bottom of the bowl a few times while you continue whipping until the cream can hold a stiff peak.